This Jeep is my toy, my pleasure and my hobby. It was rebuilt for me 10 years ago. 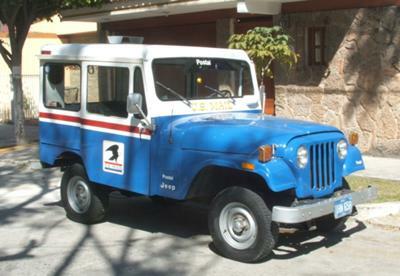 I think this style is a very romantic Jeep, remembering old times (60's). I tried to fix it as it was at that time. I live in México. It is very attractive car, so I enjoy it to drive in streets of GUADALAJARA. Larry's Comment: Excelente y muy atractivo, Sergio! Your DJ5 looks like new. I know the streets of Mexico un pocito, and this size Jeep would work very well indeed.